A friend and his young family were forced by economic hardship to squat (illegally occupy) a flat on a run-down South London housing estate. Soon after they began to hear bangs, thumps and the sound of a crying child. They put it down to neighbours in the same desperate plight until my friend awoke one night on the living room sofa to see a child skip through the room and vanish through a wall. They soon after fled to a rather less disturbing one-bedroom flat. 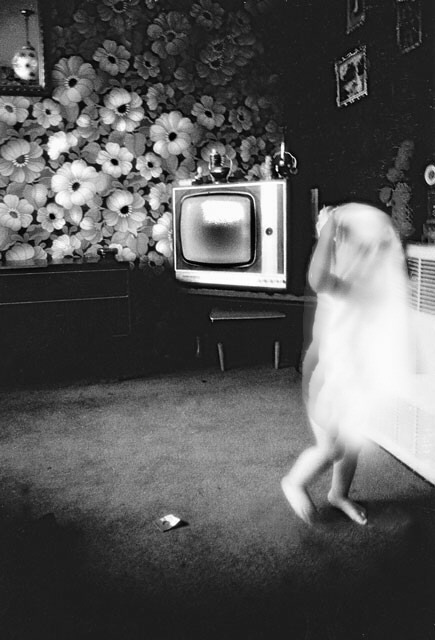 The photographer himself also witnessed objects moving and heard a child crying in the dead of night. (Although this is the flat where the paranormal incident took place this is not a real ghost).